Packing: Semi-Boite Nature varnished, with brooch, 12 cuban cigars put in a horizontal position in four groups with a silky ribbon. Features: Intense taste to cuban tobacco and wood, a little dry, wit notes of over-sweet but its goes accompanied by vague bitter points and toasted hot remembrances, those are the main Trinidad Reyes features. This cuban cigars also has a very good shot. Another must to mention feature of the Reyes cuban cigars is its excellent combustion. Solid and firm ash is characteristic in the Trinidad Reyes. This cuban cigars has an intense scent to cuban tobacco and wood, it is a little over-sweet with notes that bring resemblance of dryness and earth. 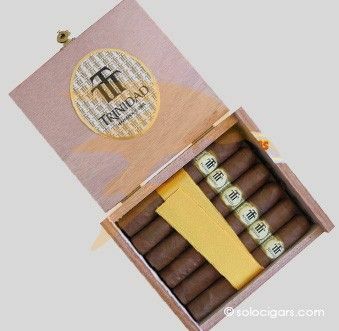 Comment: The Trinidad Reyes is one of the new cuban cigars brands of bands. Its name of gallery is an authentic guaranty. Try it!